The recent surge in the development of targeted kinase inhibitors as therapies for cancer was spurred from the success of imatinib (Gleevec®, STI571) for the treatment of Philadelphia chromosome-positive chronic myelogenous leukemia. This drug, for the first time, showed that a small molecule could be designed to inhibit an oncogenic tyrosine kinase (BCR-ABL) that was responsible for inducing malignant transformation of a particular cell type. Targeted inhibitors against the epidermal growth factor receptor (EGFR), gefitinib and erlotinib, soon followed for the treatment of certain forms of lung cancer. While these drugs can effectively treat disease without many of the unwanted side effects associated with more traditional chemotherapeutic agents, it has become clear that some patients become resistant to these agents due to the development of mutations in the kinase domains of their target proteins. 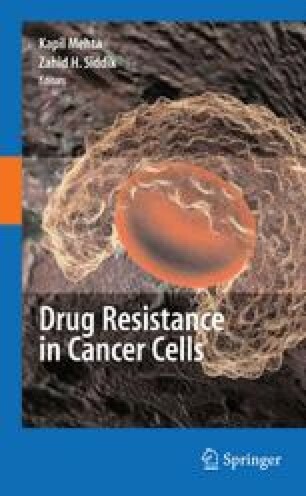 This review discusses the development of these inhibitors as well as the mechanisms associated with resistance to them. Second-generation kinase inhibitors aimed at overriding resistance to these therapies are also discussed. We are thankful to M.V. Ramana Reddy for preparing Fig. 4.1.